Not everyone enjoys being a student. Having to do homework and study topics that may not be interesting to you is not fun. But we all have to do it. A decent task manager can help you become a better student and make life easier for yourself. myHomework Student Planner happens to be such a tool. It is an elegant application that lets you track your classes, tests, assignments, and everything in between on your iOS device. myHomework has a clean calendar display that helps you get a better idea what you are dealing with every day. The app supports your schedule, whether it is block- or period-based. You can sync your classes, assignments, and other data across all your iOS devices. With a myHomework account, you will be able to get reminders and download class information when available. The app is available for free, and you can buy more themes for it. 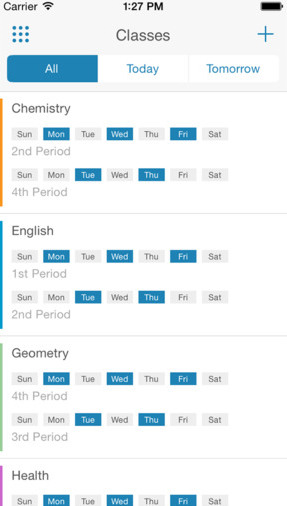 The myHomework app is designed to make you a better student. It has a user-friendly design and takes the pain out of managing your schedule, homework, and everything in between. This is a universal app.